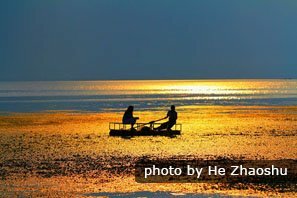 Mid-Autumn Festival is a special day in China in autumn. 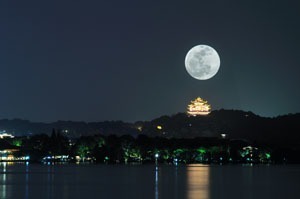 It&apos;s on month 8 day 15 of the moon calendar in China. That day is always in September or near the start of October. It&apos;s the day of the harvest moon. On that day the moon is full and bright. 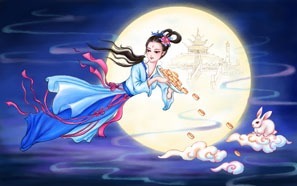 Mid-Autumn Festival is an important old festival in China. It&apos;s for people to enjoy a happy family time. It&apos;s like Thanksgiving and Christmas. Mothers cook nice food and the people in China enjoy a happy family dinner. 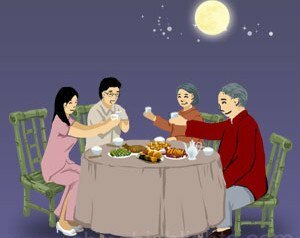 For people in China the full moon means family time. If they can&apos;t go home, they look at the moon. They know their family are looking at the moon too. 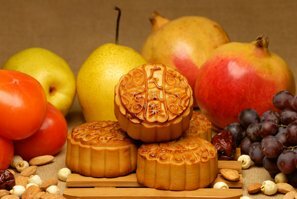 Mooncake is the most important food at Mid-Autumn Festival. It&apos;s round like a full moon. Some people call the festival Mooncake Festival. Mooncake is as important as turkey at Thanksgiving. Flower lanterns are made of paper. They are in flower or animal shapes, and painted with many colors. Teachers teach children to make them. The lanterns are beautiful at night. Lantern shows draw many people. People in China like flying lanterns. But it&apos;s not safe. It should be done when there is very little or no wind. So it&apos;s not done in very many places. People write good wishes on paper lanterns. It&apos;s like making a wish on a star. Then they light a flame inside. 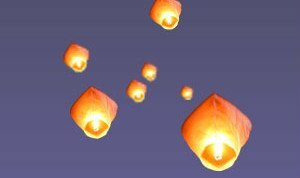 The lanterns fly into the sky like hot air balloons. 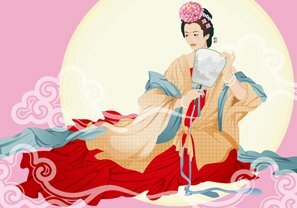 Children in China are told there is a pretty lady on the moon. At Mid-Autumn children try to see the lady&apos;s shape on the moon. Long ago there were ten suns in the sky. It was too hot. Plants and people were dying. A hero used his bow and arrows to shoot down nine suns. He saved everyone. The queen of heaven gave the hero a bottle of magic water. It would make him live forever and go to heaven. But the hero didn&apos;t want to go. He wanted to stay with his pretty wife. So he didn&apos;t drink the magic water. He asked his wife to keep it safe. One of the hero&apos;s men was bad and wanted the magic water. One day the hero went hunting with his men. The bad man stayed at home. He went to the hero&apos;s house to get the magic water. The pretty lady knew she couldn&apos;t win against the greedy man. So she drank the magic water. It made her live forever and fly to the moon.